Greenhouse gardening is the next level of horticulture but many doubt to build their own due to the cost. So here are some upcycling ideas, to inspire your very own greenhouse, on a smaller scale. You can make a greenhouse of any size, but if you don’t want to go through the trouble of pouring concrete, there is another option. 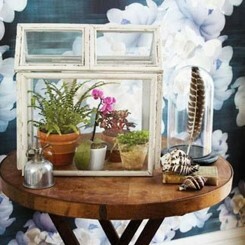 Collect old windows to create a vintage inspired greenhouse. Miniature greenhouses will fit in almost anywhere, and they have the added bonus of being portable. Prop it up using recycled furniture legs, or go without a floor so you can place it directly over existing plants. Picture frames create a truly ‘mini’ greenhouse. Simply take the backing and glass out and join four together to create your base. 4 smaller picture frames should create your roof, add with a hinge so you can open and close as required. Paint or decorate as you wish. Then, using a glue gun, secure your glass back in place. And enjoy your Victorian-style indoor oasis! Using a similar window method, you can place the glass over existing, raised garden beds. This will give you the best of both worlds!